It’s also a good thing that it won’t cost you any money to follow these principles. All you need to do is to use the electronics that you bring anyway on your trip for a greener purpose. Here are five easy ways to use your mobile phone, tablet, and camera to help you travel more responsibly. Don’t pick up any brochures – Your phone and camera has that special feature that allows you to take photos of anything and everything- use it! Instead of indiscriminately picking up pamphlets and brochures that are everywhere, take a photo of it and you’ll have it on your phone. In this way, you won’t be contributing to endless runs of more brochures being printed out. If you must pick up a map, leave it with your hotel, guest house, or to a traveller you meet on your way out of the area when you are finished with it. Use Digital Guidebooks – It’s entirely likely that your travel destination has been covered already on the internet somewhere. Going to Bangkok (Google Play | Apple Appstore) or Boston (Google Play | Apple Appstore), or how about a trip to the Antarctic Circle (e-book – $20), or an Undersea Exploration (e-book – $13)? You can find all the guidebooks you need in digital format. Finding out how to get from point A to point B is vastly easier these days. You can use applications like Google Maps (Google Play | Apple Appstore) and Rome2Rio (Website | Apple Appstore) to map out your route and find the public transportation options available by plugging in your start and end points. The apps may also give you an estimated time and cost for travelling that route. Many major metropolitan cities also have their own apps that provides useful information on how to get around by local bus, train, ferry, and even jeepney. You can pat yourself on the back after you’ve been able to figure out how to ride one of the most complex train systems in the world by using a Metro Subway App (Google Play | Apple Appstore). Getting connected and staying abreast of the news that might affect your trip gets easier each year as there are more websites and apps that can alert us with weather conditions (Google Play | Apple Appstore), flight delays (Google Play | Apple Appstore), road conditions (country-specific), and conflicts (your embassy website or other news source). This will help your trip go smoother and reduce the chance that you’ll put yourself into harms way, which in turn may eliminate your need to use and overburden the local medical facilities. Do your due diligence and find out if such apps exists for the trip you are taking and use them. Here are guides already made for some locations: Destination Tech Guides. Shop Locally – We’re spending our hard earned tourist dollars because we find value in visiting a place. Let’s try to leave as much of it as we can in the community as our token of appreciation. Patronise establishments where the local community might benefit. Use Top Ten Lists – It’s easy enough to find out what the top ten places to eat or things to do in Honolulu. Once you’ve found them, consider exploring places that are not on the list. So, yes- use the top 10 lists to figure out which places to avoid. Find that Hidden Gem, and leave it hidden – You’ve gone through the effort of avoiding the top ten list and you’re rewarded by finding that pristine secluded beach just off the main tourist trail. It’d be a shame if you tweeted about it to your 5,000 followers and it no longer remains pristine nor secluded. Keep it as your little secret- something that made your trip unique and a memory that you can take home with you. Does buying that refrigerator magnet or t-shirt that says that you Love Thailand really make it true? Ideally, you can take away your memories of a place and nothing else. If your memories tend to get hazy over time, take more photos, record some videos, keep a journal, or start a blog. Above all else, act responsibly when you travel as if you were a guest in someone’s home. *Featured Image: Heart image from UNWTO. 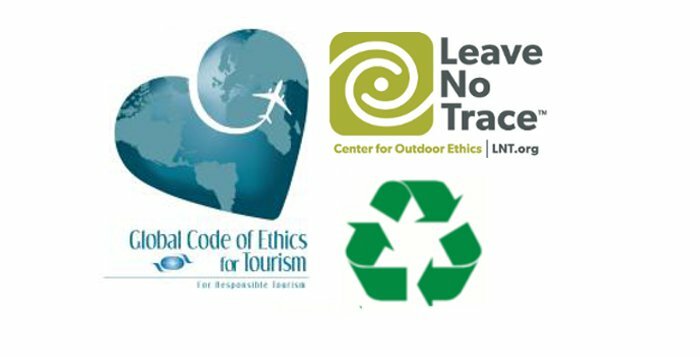 Leave No Trace image from Leave No Trace Center for Outdoor Ethics.